KREYOL: Cerca-Carvajal Haiti - Yon machine rantre andedan yon kay, li tuye madanm ak mouche ki t-ap domi sou kabann yo, li pase pran timoun yo, li travese kay kay la, li ale nan yon lot kay... Kisa-w panse de sa? This accident happened Sunday night, 04 Jan 2015, around midnight according to eyewitnesses... The husband died on the spot, the wife was taken to a nearby hospital where she subsequently died. 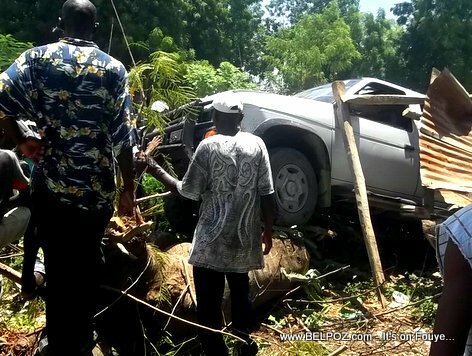 Antoine Rodon Bien-Aimé, the Député of Cerca-Carvajal confirmed this news to Haiti radio Caraibes FM Monday morning adding that the legs of one of the children were crushed due to the accident. He also mentioned that the car belongs to a Haitian police officer.